Subscribe to our Free E-Magazine on Spices. Nutmeg and Mace are two distinctly different spices produced from a single fruit of an evergreen, aromatic nutmeg tree usually 9 to 12 meters high, but sometimes reaching a height of 20 meters or more. Mace is the dried reticulated aril of nutmeg. When the peach or apricot like nutmeg bursts open, the mace is seen as an attractive bright scarlet cage closely enveloping or clothing the hard, thin, black shining shell of the seed called nutmeg. The mace is skillfully removed, gently pressed flat, dried and is called the `blade of mace`. On drying, the original scarlet color of the mace turns rather pale yellowish brown or reddish brown and becomes brittle. The plant requires a hot and moist climate with a rainfall of 150 to 300 cm per annum. It grows best at low elevations in alluvium formed of deep friable loam with good drainage, well sheltered from high winds; it does not thrive above an altitude of 750 meters. 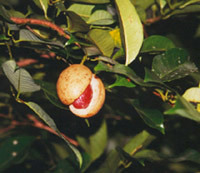 The flavor of mace is similar to that of nutmeg but is more refined. Mace is much more expensive than nutmeg. Inferior mace has usually little aroma and is brittle. Both the spices are used for flavoring a number of foods and beverages besides being used as medicine. Their pleasant aroma is due to the presence of the essential oil in them. Banda mace: It is considered to be finest. 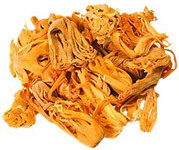 It has bright orange color and fine aroma. Java Estate mace: This mace is golden yellow, interspersed with brilliant crimson streaks like Banda mace; it is free from insect infestation. Siauw mace: It is of lighter color than Banda mace and contains less volatile oil. Papua mace: It contains comparatively little volatile oil and that to of undesirable turpentine like aroma. It is entirely unsuitable for distillation purposes. The trade considers Banda and Penang mace the entire world over as of superior quality. This true mace must be differentiated from mace consisting of the aril of other species of same genus. Being a thin lacy material, the mace is very light in weight and consequently, for every 100 kg of nutmeg a tree produces, it yields only 3 to 3.5 kg of mace. Its quality depends on its essential oil content. Mace is available in the market as `whole`, `broken`, or `ground`. Mace is in great demand in India. In spite of the fact that India is a major producer of mace, a large quantity of mace is being imported every year. Therefore, there is huge domestic demand of this spice in India. That is the reason the cultivation of mace is gradually expanded. It contains a volatile oil (4 to 15%), amylodextrin (25%), reducing sugar, pectin, resins and coloring matters. The leaves yield on water distillation, 0.41 to 0.60% of a light brown volatile oil with a pleasing spicy odor. Steam distillation of dried leaves give 1.58% of a colorless volatile oil containing alpha-pinene (80%) and myristicin (10%). 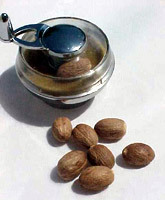 Oil of Mace resembles nutmeg oil in odor, flavor and composition and no distinction is made between them in the trade. Like nutmeg oil, mace oil also becomes viscous on storage due to absorption of oxygen. Old mace yields more viscous oil than the fresh one. Freshness of mace thus is judged accordingly. Fixed Mace Oil: Mace yields a fat similar to that from nutmeg but in a much smaller amount. The fixed oil is a semi drying oil. However, it may not be economical to extract the oil. The amylodextrin is present in mace in the form of granules, visible under the microscope. They are compound and irregular in shape with distinct hilum. Nutmeg and mace are generally classified as baking spices, since both are particularly good in sweet foods (especially, doughnuts and dough). However, they find a much wider range of use than other baking spices. They are frequently included in frankfurter formulae and in recipes for curried meat and other products. In India it is frequently used in Mughlai dishes. Both nutmeg and mace are much used in soups and preserves, in sauces, in combinations with dairy products. Nutmeg, in general, tends to be sweeter and more delicate than mace. For light colored foods, such as pound cakes, cream pies and cream soups, mace is often chosen because of its own light orange color. Mace is often chewed for masking foul breath. However, use of nutmeg in India is greater in the kitchen and in medicine than mace. Their volatile oil is used as a flavorant in liquor, tobacco and dental creams. In India, mace and nutmeg are used more as drugs than a condiment due to their valuable medicinal properties. Both are stimulant, carminative, astringent and aphrodisiac and are used in pharmaceutical preparations for dysentery, stomach ache, flatulence, nausea, vomiting, malaria, rheumatism, sciatica and early stages of leprosy. Excessive doses, however, have a narcotic effect. Nutmeg is used in the treatment of skin diseases like ringworm and eczema. The paste of the herb prepared by rubbing it on a stone slab in one`s own early morning saliva---before cleansing the mouth---is applied once daily as a specific remedy in the treatment of these conditions. In case of a running nose, a paste made from this with cow`s milk and 75 mg of opium should be applied to the forehead and the nose; it will provide quick relief. Precautions: Nutmeg should be taken in very small doses; in appreciable doses it excites the motor cortex and produces epileptic convulsions and lesions in the liver. Even a teaspoon of nutmeg can produce toxic symptoms such as burning in the stomach, nausea, vomiting, restlessness and giddiness with hallucinations.Skin Disdorders Nutmeg is used in the treatment of skin diseases like ringworm and eczema. The paste of the herb prepared by rubbing it on a stone slab in one`s own early morning saliva---before cleansing the mouth---is applied once daily as a specific remedy in the treatment of these conditions.